Vitamins and minerals are needed after surgery so the body can heal properly. They also regulate the metabolism and help convert calories into energy. Unlike carbohydrates, protein, and fat, vitamins and minerals are only needed in small doses. The ASMBS recommends 10,000 IU per day of Vitamin A. How much B1 (Thiamine) do you need? The ASMBS recommends 3mg per day of B1 (Thiamine). The ASMBS recommends 1000mcg per day of B12. The ASMBS recommends 120 mg per day of Vitamin C.
The ASMBS recommends 1,200 mg of calcium per day for gastric bypass and vertical sleeve patients, and 2,400 mg of calcium per day for duodenal switch patients. The ASMBS recommends 3,000 to 6,000 IU per day of Vitamin D3. The ASMBS recommends 400mcg per day of Folate. The ASMBS recommends 40-60mg per day of Iron. IMPORTANT: Vitamin K can affect how blood-thinning drugs, like Coumadin (warfarin), work. It is important that you address this with you surgeon and/or dietitian if you are currently prescribed anticoagulant or antiplatelet drugs before engaging in a vitamin regimen that contains high levels of vitamin K.
The ASMBS recommends 160 mcg per day of vitamin K.
The American Society for Metabolic and Bariatric Surgery is the largest national society for metabolic and bariatric surgery. The Society strives to improve public health by lessening the burden of obesity and related diseases around the world. 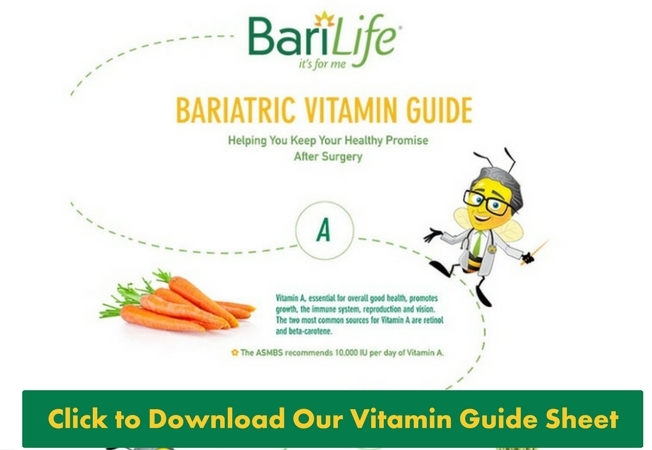 The All-In-One Bariatric Multivitamin Tablet or Powder by Bari Life, of course! I got B12 deficiencies after gastric bypass surgery. Is it necessary to take B12, my doctor recommend Eligen B12 any guys know about this? I did RYGB ON 30/9/2017 , looking for the best multivitamin.